On April 12, 1861, the Civil War began when shots were fired on an unfinished fort in Charleston Harbor. From that thunderous opening salvo, the naval battles to control the Atlantic coast that followed-daring, savage, and often deadly-were not only crucial in determining the outcome of the war and the fate of a nation, but would change the face of naval warfare forever. Historian Jack D Coombe, author of the critically acclaimed Thunder Along the Mississippi and Gunfire Around the Gulf, combines brilliant research with a novelist's flair for re-creation to put us directly into the action of the Civil War on river, on shore, and at sea. In this vivid account, we experience the soul-gnawing terror of a bombardment, the claustrophobic confines of a still-unproven submarine, and the smoke-choked chaos of a harbor in the grips of a full-bore naval engagement between two desperate enemies. 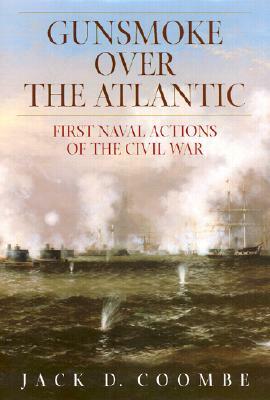 Coombe focuses on the Civil War as it was fought along the Atlantic coast, a fierce contest of blockaders and blockade-runners, ironclads, wood-hulled battleships, land cannon, submarines, and the first underwater antiship weapons. For the North, the challenge was to implement a blockade over 3,500 miles of Confederate coastline, from Virginia to Texas. To do so, they would have to modernize an ineffective and outdated U.S. Navy fallen into incompetence and disrepair. For the South, the challenge was to create a fledgling navy from whatever meager resources were at hand. The Confederacy patched together a navy of river runners and converted battleships, turned cornfields into shipyards, and put the first ironclad battleship into action. And it was the South thatintroduced the new concept of underwater weaponry, sending spar torpedoes, mines, submarines-and a few incredibly brave men willing to deploy them-into battle against the North. Gunsmoke over the Atlantic chronicles the key engagements, from the Monitor" "and the Virginia dueling at Hampton Roads to the ill-fated campaign against Fort Fisher. Along the way, we meet a remarkable cast of naval strategists and warriors on both sides of the battle, witness the crucial, often deadly role played by the weather and the sea itself, and get a vivid view of such important events as the first amphibious landing in history, at Cape Hatteras in 1861. An important work for students of the Civil War and of naval history, this book fills in missing pieces of America's most tragic war and shows why, when the guns finally fell silent, a new era had begun. Four years after the fall of Fort Sumter, a once divided country had the beginnings of the most powerful navy in the world. Author Name: Coombe, Jack D.
Keywords: MILITARY. NAVY. CIVIL WAR.